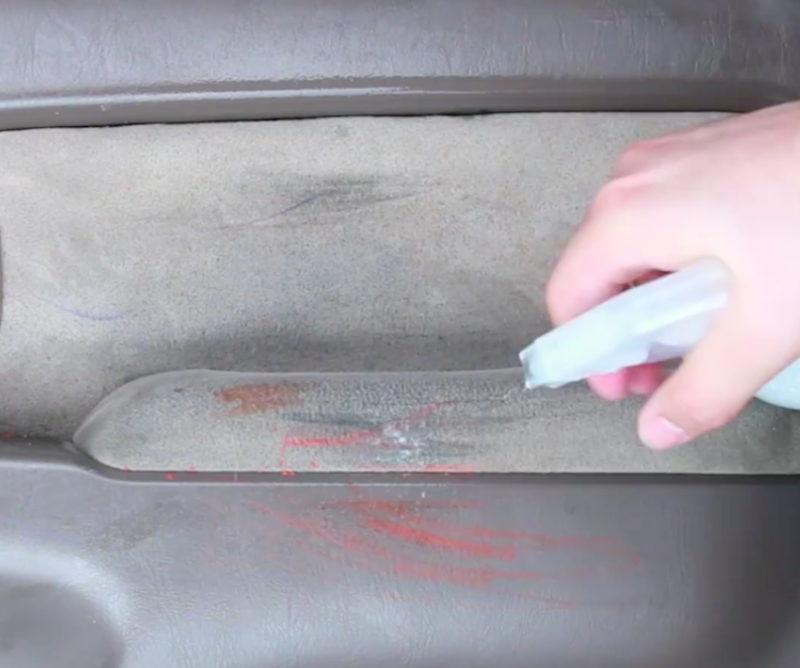 How to remove scratches, hide your cash, and cool down your steering wheel. 1. Stick a muffin tin in a laundry basket to hold your drinks if there aren't enough cupholders for your whole group. The laundry basket will make the muffin tray more stable and make sure none of the cups fall out! Wrap a seatbelt around the basket for extra stability. Learn more here. 2. Keep a cereal dispenser in your door so you have a discreet place to toss your trash. Just pop open the top to stick the trash in and pull the whole lid off to empty it. Learn more here. 3. Wipe your steering wheel with a damp cloth if it's so hot you can barely touch it. If you've never had this problem, you haven't driven a car in summertime. To quickly cool down your steering wheel (or seat or seatbelt), just spritz a cloth with cool water and wipe everything down. You can keep the water and cloth in your dashboard. It's okay if the water gets hot — it's actually the evaporation that cools everything down. Learn more here. 4. Make a secret compartment for your cupholder. You can either stick the rubber coasters already in the cupholders onto the top of the container or you can cut up a mouse pad. The container fits perfectly in the cupholder and can fit small valuables like jewelry, keys, or money. Learn more here. 5. Hang a sheet protector from the seat rest so your kids can watch movies on long car rides. No more cranky kids screaming in the back seat or touching your iPad with their sticky fingers! Just loop a string through the holes and tie it to the head rest. Use clothespins to hold the iPad inside. Learn more here. 6. Pop this magnetic attachment on your air vent to mount your phone the second you get in the car. This is such an easy and effective car mount, it has more than 1,000 fans on Amazon! All you need to do is put a small metal sticker on the back of your phone (It works through your phone case) and the magnet will grab it. It's got a strong hold and you can even hang the phone horizontally if you like! 7. 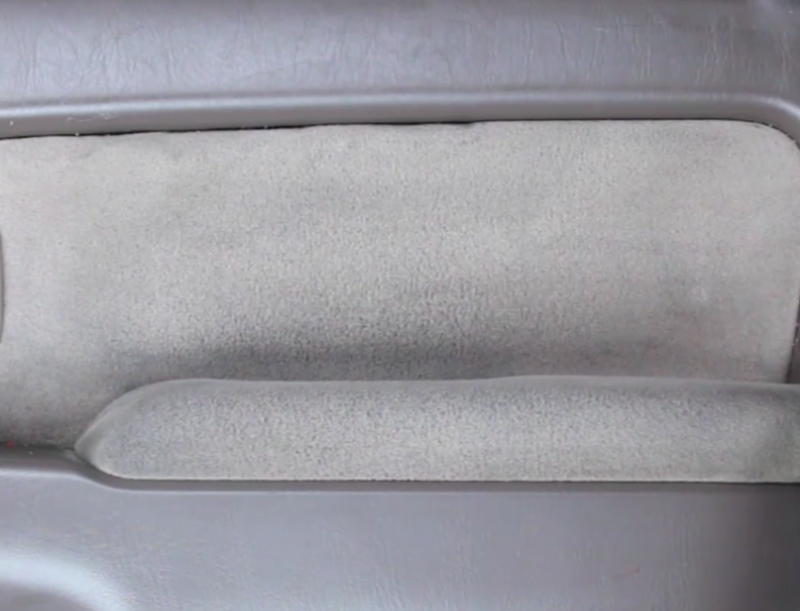 Spritz your seats with water and pull a squeegee across the seats to easily collect the pet hair. The water will help the hair clump together when you drag the squeegee across the fabric. Learn more here. 8. Attach a pool noodle to the garage wall so you don't damage your car every single time you open the door. Use a few drywall screws to secure the pool noodle to the wall. Learn more here. 9. Clean your windshield wipers with alcohol wipes if you keep getting annoying streaks. The alcohol will remove any residue that's sticking around and causing streaks. Just pinch tightly around the blade and drag the wipe from tip to tip. Learn more here. 10. Mix up some cleaning slime to get the crumbs out of awkward crevices. It's squishy enough to fit in tight corners and sticky enough to pick up all those tiny crumbs. Mix 4 ounces of white glue and 1/2 tablespoon of baking soda, and then add 1 tablespoon of contact lens cleaning solution. Squish it into the cupholders, in between the buttons controls, or in the stitching in the car seats. Learn more here. 11. Suspend a cargo net from the ceiling to stow your coats above everyone's heads. Hanging coats on the provided hooks blocks the windows. The net will act as a hammock for the coats. You could also hang your dry cleaning from the netting if you've got more than can fit on the handles. Learn more here. Get the net from Amazon for $4.31. 12. Hang your purse and umbrellas from a carabiner so they're not rolling around on the floor. You could also use carabiners to carry all of your grocery bags into the house with one hand or to hang a trash bag from the head rest. Learn more here. 13. Move keys on and off the ring with a staple remover. You're way less likely to get your fingers caught in that torture device. Learn more here. 14. Leave the remains of a candle in the car to make the interior smell like your favorite scent. The wax will soften in the heat and release the fragrance. So much better than that ugly air freshener! Learn more here. 15. Or clip cotton balls scented with your favorite essential oil so the smell is released every time the air is on. When it dries out, you can switch up the scent with a different essential oil. Learn more here. 16. Keep quarters in a pill bottle so you don't have to dig around the seats to find enough to feed the meter. The bottle is small enough that it won't take up much space but big enough to fit more than enough quarters. Learn more here. 17. Encourage your kids to be on their best behavior on road trips with this simple behavior tracker. If the kids are stuck in the car for long periods of time, they're bound to get a little crabby. If they start yelling or bickering, take down their assigned clothespin. Whoever's clothespin remains gets a reward at the end of the ride. Learn more here. 18. Mix club soda, vinegar, lemon juice, and dish soap to make a natural car cleaner. Spray the mixture on the upholstery and scrub the area until the stains disappear. Use a towel to dry the material and reshape the fabric. Learn more here. 19. Spray your windshield with watered-down rubbing alcohol to quickly break down the frost on chilly mornings. Mix 1/3 part water and 2/3 part isopropyl and spray it all over the frost. Because alcohol doesn't freeze unless in very extreme temperatures, it'll break down the ice so you aren't spending half of your morning hacking at it. Learn more here. An item in this post was removed to reflect BuzzFeed's editorial standards.